Bold, brash and ballsy — these words only begin to describe renowned French-born photojournalist Catherine Leroy (1945 to 2006), whose images brought the realities of wars from Vietnam to Somalia back home to North American audiences. 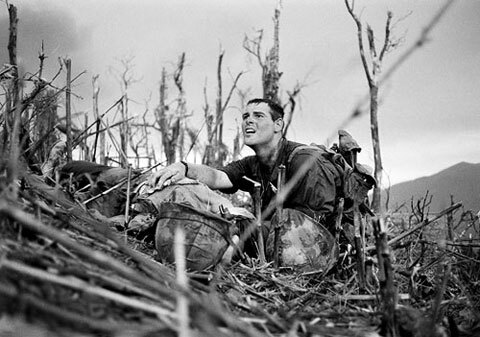 In 1966 at age 21 and at the height of the Vietnam War, a determined Catherine set out to pursue her dream of becoming a photojournalist and document the human cost of war. “I bought a one-way ticket to Saigon, and flew off with $150 and a Leica. I wanted to be a war photographer, but I had never heard a shot fired in anger,” she said. If a picture is worth a thousand words, then the person — the eye — behind the lens is of crucial importance. In this era of image-saturated media, the kinds of images we see shape our view of the world and what happens in it. Catherine understood that power and sought to bring the ground level tragedy of war into public view. Once on the ground in Saigon, she quickly talked her way into a photographic assignment and it was her photographs that ended up capturing the public imagination and becoming some of the most iconic images of the war. She sympathized with the ordinary people affected by conflict and by the soldiers on the field, and she shared their dangers. In 1967 in the DMZ (demilitarized zone), she was the only survivor of a mortar blast in which her own camera equipment ended up protecting her. She had shards of shrapnel in her body ’til the day she died of lung cancer at the age of 60. She was also taken prisoner by the North Vietnamese briefly during the Tet Offensive in 1968 and ended up not only talking her way out of captivity but with a series of photographs of North Vietnamese troops that no one else could have taken. Her story and images made the cover of Life magazine. Catherine was respected by the soldiers she worked alongside and became known for her physical toughness — and this despite a petite 5-foot-nothing frame. She crawled through rice paddies and hid from enemy troops along with them, and took part in a combat jump with the 173rd Airborne during Operation Junction. She was also known for her salty vocabulary and for tussling with her editors. Her visceral images capture the human anguish and bloody destructiveness of war. After the Vietnam War ended, she went on to cover conflict zones in Lebanon, Somalia, Northern Ireland, Afghanistan, Cyprus, Iran, Iraq and Libya. Catherine and her work won numerous awards, including the prestigious George Polk award for News Photography and the Art Director’s Club of New York Award, among others. She died in California, where she’d made her home, in July 2006 after blazing the trail for the female photographers and journalists covering war zones who came behind her.